A comfortable new safety and anti-fatigue mat designed for long life in high traffic work areas such as factories, storerooms, warehouses and workshops has been introduced by The General Mat Company. Hog Heaven No. 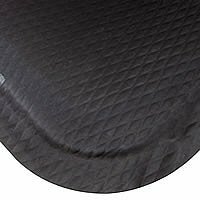 260 matting features a solid nitrile rubber surface for better chemical resistance, combined with a 16mm thick closed cell nitrile/PVC cushion backing for long-lasting comfort without breaking down. General Mat Company Managing Director Mr Michael Siegle says Hog Heaven&apos;s cushion is moulded to the nitrile surface to ensure a cleaner, more uniform construction. Safety is further enhanced by a slip-resistant textured nitrile surface and by a 100 per cent nitrile rubber border that remains flexible for the life of the product without cracking or curling. "As Australia&apos;s workforce ages - and as the physical and economic consequences of slip and fall accidents become more of a risk - it is more important than ever to ensure people aren&apos;t standing on hard surfaces for extended periods." says Mr Siegle. Quite apart from lost workdays and compensation costs resulting from slip and strain injuries, there is increasing personal litigation against employers and building owners who are shown to have been negligent in their responsibilities under WorkCover provisions and the Building Code of Australia. It not only provides superior performance from the date of installation, but also its quality construction sustains this performance over the long term and prevents matting breaking down and tripping the very people it is meant to protect." Available in either black or with yellow/black chevron borders, Hog Heaven comes in four standard sizes or custom lengths up to 6.6 metres in widths of 600mm, 830mm or 1160mm.